The Marshall 900 series of pews have been in continuous production since 1946, after a five year research and development period. Its continued popularity is due to the simple fact that this pew is the ultimate combination of comfort, utility, and durability. Your congregation can worship in ease and comfort while enjoying the benefit of its elegant contoured back and wide “ShoulderRoll” cap rail. 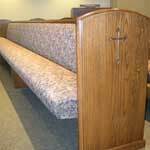 And as for durability – this pew boasts the strongest frame in the industry with a spring design that prevents that “bottoming out,” so common in inferior pews after several years. It is hard to go wrong when choosing this design – its beauty and elegance will grace your house of worship for many years! The model #946 has a solid hardwood framed spring seat, padded back with lumbar support, and Marshall exclusive “ShoulderRoll” cap rail. 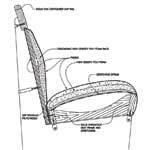 The model #925 has our exclusive hardwood framed spring seat, padded back with lumbar support, and our traditional style cap rail. 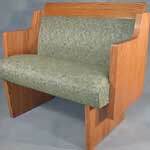 Shown with #643 solid oak pew ends with optional edge and cross routing.